Having lost their heads, been pulled from their plinths, smashed and even buried, things are at last looking up for some of the unluckiest statues in Christendom. For five centuries the 12 apostles looked down on the adoring hordes who marvelled at the Sainte-Chapelle in Paris, arguably the greatest Gothic edifice ever build. Standing between its spectacular stained glass windows -- one of the wonders of the medieval world -- they could have been forgiven for feeling smug having survived the Reformation without a scratch. But the statues were caught in the whirlwind of not just one French revolution but two, and since then history has been less than kind. A team of French scientists are at last revealing their original colours and forms from 1248 when they first stood guard over one of the most revered of Christian relics, the crown of thorns that Christ reputedly wore on the cross. French king Louis IX built the staggeringly beautiful private chapel to house the relics after buying them from the cash-strapped Latins who sacked Constantinople in 1204 and began stripping the Byzantine capital of its treasures. The crusader king, who was later made a saint, also acquired parts of the True Cross and the Holy Lance for the chapel, which backed onto his royal palace. Six of the most heavily damaged of the apostle statues are now being analysed by the French museums' restoration and research centre, known as C2RMF, at its laboratories underneath the Louvre. 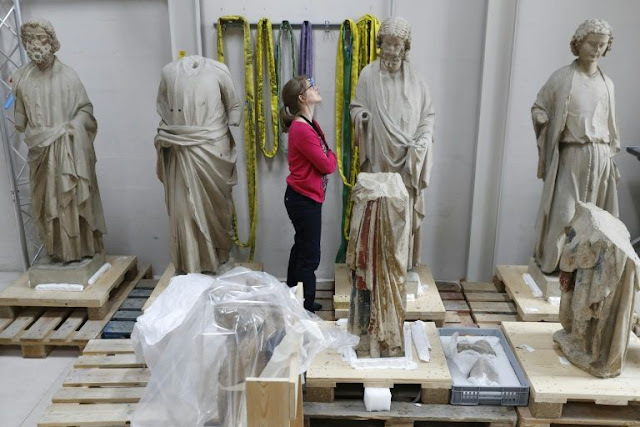 Its director of sculptures Alexandra Gerard told AFP that as well taking tiny samples from "the sandwich layers" of paint to find the first coat under a microscope, experts were also trying to crack the puzzle about how the much-damaged, repaired and repainted statues were first made. Using X-rays and ultraviolet scans they have been able to cast new light on statues whose nicknames are vaguely reminiscent of the Seven Dwarves, from "The Melancholic" and "The Philosopher" to the "Headless One". But the most exciting potential discovery for the Cluny Museum of the Middle Ages in Paris, where the six badly damaged apostles are held, is how different the original colours were. 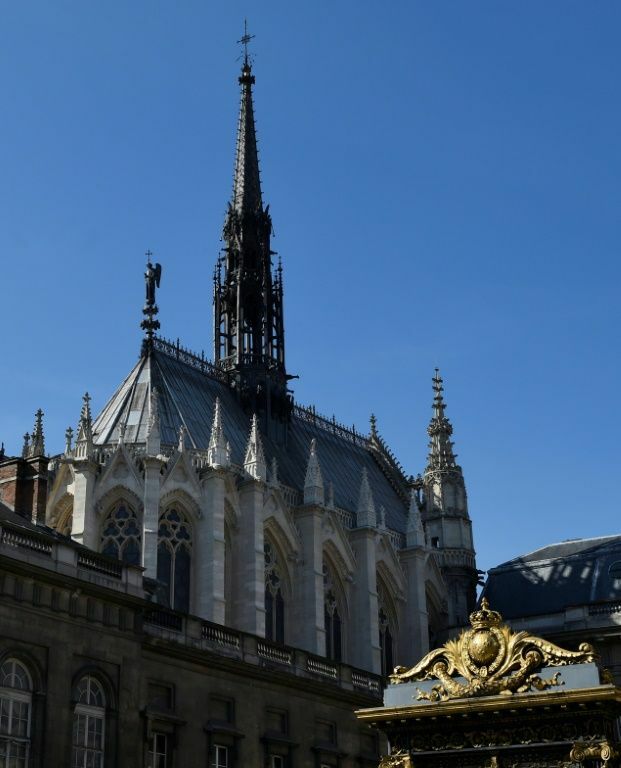 "The statues in the Sainte-Chapelle now are very highly coloured like its stained glass," said curator Damien Berne. "However, it seems that in the 13th century they had a very different chromatic range" which may have been designed so "the apostles stood out" from the windows. Although tests are still going on to confirm the findings, he said the statue known as "The Melancholic" may also not have been quite so down in the dumps as he now seems. His head may simply not have been put back on his shoulders correctly after he was roughed up by French revolutionaries. The statues' vicissitudes began in the tumultuous decade after the fall of the Bastille in 1789. Torn down from their plinths they were unceremoniously cast aside; two ended up broken and buried under a pavement and the others were dispersed to various storehouses and museums. They fared even worse in the revolution of 1830, when four lost their heads to rioters. But for a pious old woman who managed to pick up and hide the heads they would have been lost forever. While restoring the chapel in 1840 the architect Felix Duban tried to put all the statues back in their place. But the four decapitated saints and the two buried ones were judged to be beyond repair and handed on to the Cluny Museum. Yet somewhere along the line another head had gone astray. In the meantime the surviving apostles and six plaster replacements got a striking Gothic Revival paint job which endures to this day. 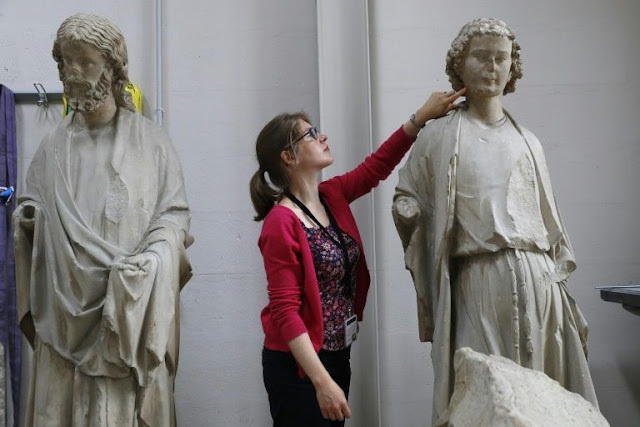 After the tests are completed, the Cluny Museum -- which houses France's main collection of medieval treasures -- hopes to have the statues cleaned so that they can be installed in their own gallery in 2020. By then "maybe we will have found which apostle is the true owner of the 'charming' little foot" which languishes legless in the museum's storage, said Berne.